The Chorny Dyv rocks are a true natural wonder. 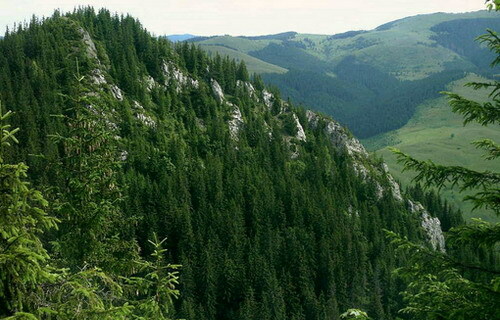 The rocks are in the Chyvchyn mountains, one of the most beautiful places of the Ukrainian Carpathians. Here, on the border of the Sarata and Perkalab rivers you’ll see picturesque rocks surrounded by a coniferous forest with steep 50-60m high walls formed by gray and green-gray lime stones of the Jurassic period (aged 210 million years). The walls are broken with deep vertical splits where you can find mountain edelweiss flowers which are quite rare for the Carpathians. You can also meet other endemic species here. The rocks give a wonderful view on the surrounding Carpathian ridges.